But that was then. For the past several years Dallas has been in an uncharacteristic funk, its population growth flat and its leaders lamenting its vanishing middle class, troubled schools, dysfunctional government, and chart-topping crime. Distracted by all the hand-wringing, few in Dallas seem to realize that they’ve suddenly become part of a bigger and more compelling urban success story. Call it the Revenge of the Metroplex: Just a few years after nearly being written off the map, it has become a roaring engine of growth and social transformation. And its improbable rise promises to not only reignite Big D’s fading star but also reset our nation’s political and cultural compass. How is a region dissed for decades as a colorless, conformist lightweight going to do the former, much less the latter? For openers, with a population that has ballooned to nearly six million, the Metroplex has quietly become a demographic heavyweight. 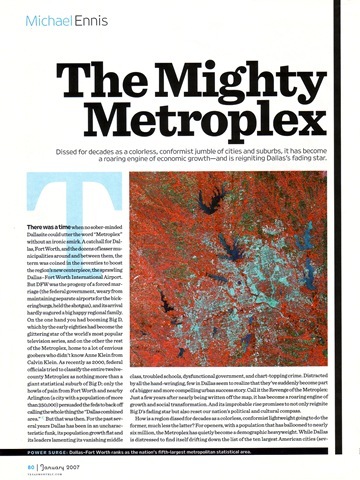 While Dallas is distressed to find itself drifting down the list of the ten largest American cities (seventh in 1980, ninth today), the Metroplex, now dubbed by the chastened feds as the Dallas-Fort Worth-Arlington Metropolitan Statistical Area, is currently the nation’s fifth-largest MSA but closing so fast on the Philadelphia area that it has almost certainly passed it already. That leaves just the giant Chicago, Los Angeles, and New York metropolitan areas remaining; while they’re still a lot bigger, during the past five years the Metroplex has gained more total new residents than any of them. Among the nation’s largest metro areas, only Atlanta and Houston have had comparable double-digit growth. Stuck in the middle of flyover America, the Metroplex has transformed itself into a globalized, fly-to destination, with the world’s third-busiest airport as its entrepôt and a cosmopolitan population that stands on its ear the oft-heard, covertly racist rubric that our nation’s multicultural coastal metropolises aren’t the “real America”—the implication being that a more homogeneous heartland presumably is. Yet here in the heart of real-deal Texas, the nation’s largest red-state megalopolis is actually a showcase for all-American diversity. Its most populous county, Dallas, voted blue in November, and compared with its closest statistical peer, the Philadelphia MSA (which spills over four blue states), the Metroplex is notably less lily white, at more than 42 percent African American, Asian, or Hispanic, versus the Philly area’s 30 percent. Belying another stereotype—or two—the Metroplex also has a higher percentage of college graduates. While Dallas is already a minority-majority city, all that diversity is hardly ghettoized within the city limits. Of the Metroplex’s million and a half Hispanics, two thirds of them live outside Dallas—as do all but an eighth of the area’s 250,000 Asians. The bedroom communities that surrounded Dallas a quarter century ago have become midsize cities with prominent minority and immigrant populations; Plano, just north of Dallas, has metamorphosed from a farm town of 3,695 residents in 1960 to a wealthy city of 250,000 people today—and 40,000 of them are Asians. From mom-and-pop Salvadoran restaurants to Korean shopping centers and Mexican supermarkets to the Iranians and Indians who started up some of the area’s most heavily capitalized technology firms, immigrants are embroidered throughout the Metroplex economy. Dallas has long boasted of its ambition to be an “international city,” and it most certainly has become one; the irony is that it’s surrounded by a ring of former suburbs that have become international cities as well. If this race to urbanize wasn’t competitive enough, there’s also Fort Worth. At about half the size of Dallas, it’s now the nation’s nineteenth-largest city—bigger than Boston or Seattle—and, unlike Dallas, still growing at a rapid clip. The grudge match between the two cities predates the Metroplex itself, and the historic airport feud has been superseded by a long-running rivalry over cultural bragging rights. A generation of Dallasites has been galled to admit that a place that still proudly calls itself Cowtown has three world-class museums, each a global architectural landmark as well, all packaged in a nifty cultural district. The center of downtown Fort Worth has more recently been transformed into a pedestrian-friendly shopping-and-entertainment district, and the city’s plans for development along the Trinity River are outpacing Dallas’ similar, much-more-intensely-hyped initiative thirty miles downstream. All but besieged by ambitious neighbors, Dallas has come to a widely remarked tipping point: Either grow up and become the cutting-edge center of a mushrooming global megalopolis or devolve into an urban ghost town like Detroit. To avoid the latter, Dallas movers have focused on the same strategy as many of the Metroplex’s lesser municipalities: reinventing their city as, well, a city. Like, say, Chicago, which in 2001 beat out Dallas for the new corporate headquarters of aircraft manufacturing giant Boeing when company executives found that Big D’s cultural life wasn’t competitive. True, Dallas has long claimed the nation’s largest downtown arts district, but until recently it was basically an expanse of parking lots bound by a couple of astringently tasteful modernist monuments, the Edward Larrabee Barnes–designed Dallas Museum of Art and the I. M. Pei–designed Symphony Hall, both built back in the eighties. In a city where Picasso once touched off a Red Scare, and which remains one of the largest in the country without a contemporary-art museum (Fort Worth, of course, has one of the nation’s biggest and best), Dallas’s cultural ambitions have historically warred with its fundamental conservatism. But getting bounced by Boeing was a turning point. The languishing arts district got new life (and, finally, a museum up to Fort Worth standards) when Dallas developer Raymond Nasher opened his Renzo Piano–designed Nasher Sculpture Center in 2003. Construction is imminent on a sleek new civic hood ornament, a futuristic suspension bridge across the Trinity River by Spanish modernist Santiago Calatrava, with two more planned. The great leap forward, however, will be two years from now, when the arts district debuts the Center for the Performing Arts, a landscaped ten-acre complex anchored by British architect Norman Foster’s opera house, which will be a startling translucent red drum covered with a giant high-tech sun canopy, and Dutch architect Rem Koolhaas’s even more iconoclastic theater, a transparent twelve-story cube where backstage will essentially be stacked on top and bottom of the stage. Like Piano, Foster and Koolhaas create highly interactive buildings that expose their users to the city around them and invite passersby to become voyeurs; unlike so many of Dallas’s architectural baubles, these buildings are intended as icons of a city center that will actually be inhabited. And the inhabitants are starting to trickle in: Discarded downtown skyscrapers are being converted to luxury condominiums, and the high-rise mixed-use complex planned around the five-year-old downtown sports arena, after being put on hold, is starting to build out. Uptown, a stylish, pedestrian-friendly neighborhood of shops, apartments, and restaurants linked to the arts district by trolley, has been booming for more than a decade. Of course, the same kind of thing is happening nationwide, as well as in other Texas cities, like Houston and Austin (which currently has more downtown residents than Dallas); in a lot of places “culture war” now means duking it out with civic rivals over whose downtown has the most culture. But the Metroplex is a front particularly worth watching, because this red-state region has been so central to that other culture war, the one that for a time put Republicans in control of Congress and the White House. 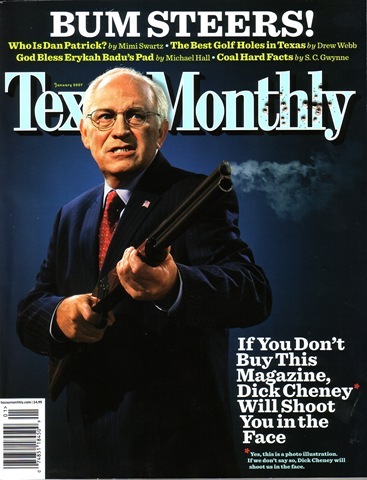 The GOP majority was as much sprawl based as it was faith based, with social conservatives fleeing as far as possible from Sodom-like city centers dominated, according to their rhetoric, by pointy-headed, Brie-eating, latte-sipping liberal “elites” intent on aping the morally bankrupt secular culture of “old Europe.” The Metroplex has long been one of the great engines of this centrifugal conservatism; veteran political observers oohed at the more than 70 percent Republican vote in Collin County, which includes Plano and newer, booming exurbs like Frisco, and saw in the ceaseless flight from the center—geographically as well as ideologically—the endless hegemony of social and religious conservatives. The rise of the Brie-eating, modern art–loving Republican elite in the heart of Bush country doesn’t even scratch the surface of the Metroplex’s political and cultural complexity. Its blue center now runs on black power: Dallas’s disciplined African American voters, who weren’t even fully enfranchised politically until 1991, propelled Democrats to a near clean sweep of the Dallas County courthouse in the recent midterm elections. Waiting in the wings is the area’s huge, yet-to-register Hispanic population, more than 350,000 of whom went into the streets last spring to protest Congress’s immigration policy. Think of the Metroplex as a giant test tube filled with all of today’s critical conflicts: secularism versus religious fundamentalism, immigrants versus nativists, urban versus rural, red versus blue, black versus brown versus white, environmentalism versus unfettered growth. Out of this primordial brew, twenty-first-century American politics and culture are going to emerge in all sorts of surprising new configurations. We had better learn how to say the name of our youngest urban giant with a straight face, because the complicated, rapidly evolving Metroplex now offers an attraction that should make all its metro-area competitors envious: an unmatched view of our nation’s future.